H.E. 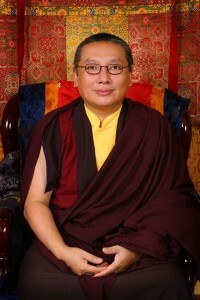 Zurmang Gharwang Rinpoche was born on the 30th of June, 1965, and prior to his birth he was recognized by H.H. 16th Gharwang Karmapa as the twelfth incarnation of the Gharwang Tulkus. He is the supreme lineage holder of the Zurmang Ear Whispered Lineage (zur mang snyan rgyud). The unbroken line of the Gharwang Tulkus begins in the 14th century with the great siddha Trang Mase, the first Gharwang Tulku and founder of the Zurmang Kagyu tradition and Zurmang Monastery. He was identified by the Fifth Gyalwa Karmapa, Deshin Shegpa as the omniscient emanation of the Indian mahasiddha Tilopa. This was the fulfillment of Tilopa’s prediction made after he received teachings directly from Vajrayogini in the Western land of Uddiyana, in which he had pledged to return to spread these teachings widely, after they had been transmitted through thirteen successive lineage holders. Before Tilopa’s return this set of teachings was to be limited to a one to one transmission from each lineage holder to the next, and only upon Tilopa’s later emanation as the first Gharwang Tulku were they opened up to a larger audience. These teachings form the core of the Zurmang Ear Whispered Lineage (zur mang snyan rgyud) also known as the Dakini Hearing Lineage (mkha’ ‘gro snyan rgyud). Rinpoche was born a prince of the Sikkimese Royal Court. His uncle was then the reigning King of Sikkim. However, even before his birth the Sixteenth Gyalwa Karmapa identified him as the 12th Zurmang Gharwang. His Holiness the Karmapa, who had alluded to his attendants that the next incarnation of Zurmang Gharwang would soon occur, was attending a performance of traditional Tibetan drama on the forecourt of Rumtek Monastery. During the Tilopa dance, a Jewel offering was made to the Karmapa, and breaking with tradition, instead of accepting it himself he directed that the gift be given to the Gharwang Tulku. So saying, he pointed to the surprised mother-to-be and announced that she was carrying the 12th Gharwang Rinpoche. A few months later, the Royal Princess delivered her predicted son at her residence in Gangtok. At dawn Rinpoche’s parents had dispatched a messenger to go to Rumtek 24km away to inform H.H. the Karmapa of the new arrival. However, before the messenger could leave the house, the late Saljay Rinpoche, the Karmapa’s emissary, with a party of monks was already at the door, bearing gifts and a letter containing the Karmapa’s blessings for the newborn child. Even more bewildering was that at the time when the new tulku was born, the mother of the previous Gharwang, living in Tibet, was heard joyously announcing that, “Rinpoche had returned. He is born in a warm country where fruits and flowers grow in abundance, and in the midst of bird song.” Her description of the environment surrounding the birth of the new incarnation aptly befitted Sikkim. In 1976, shortly after his eleventh birthday, Gharwang Rinpoche was installed on the Lion Throne as the Twelfth Zurmang Gharwang. The ceremony took place in the Assembly Hall of the Dharma Chakra Center in the presence of His Holiness the Sixteenth Gyalwa Karmapa. It was well attended by many incarnate tulkus, monks, and state dignitaries. Hundreds of well-wishers and devotees came from far and wide to witness the auspicious event. During the ceremonial installation, His Holiness the Karmapa gave Gharwang Rinpoche his name, “Karma Gharwang Chochung Tenpa Namgyal Thinley Kunkhyab Pal Zangpo,” which means The Victorious Protector of Buddha Dharma With Excellent Qualities and All-Pervasive, Auspicious Activities. In addition, His Holiness the Karmapa also predicted the founding of a new Zurmang Kagyu monastery outside Tibet which would become an important center for the teaching and practice of the Buddha Dharma. In the years following his enthronement, Gharwang Rinpoche received many personal empowerments, textual transmissions, as well as oral instructions directly from his root lama, the Sixteenth Gyalwa Karmapa. After the passing of His Holiness, Gharwang Rinpoche studied at the Nalanda Buddhist Institute between 1981 and 1991, and graduated as the top student in the year of 1991. Among his many illustrious teachers were the late Kaly Rinpoche, the late H.E. Jamgon Kongtrul Rinpoche, the late Tulku Urgyen Rinpoche, the late Khenchen Pema Pedtse Rinpoche, Sharmapa, Situpa, and Gyaltsapa. In addition, he studied under the guidance of renowned Buddhist scholars such as Khenchen Thrangu Rinpoche, Khenchen Tsultrim Gyamtso, as well as Khenchen Chodak Tenphel. In 1987, while still an undergraduate, Gharwang Rinpoche began his teaching career at the Nalanda Buddhist Institute. Since then, he has taught extensively in dharma centers all over the world, in Europe, America, as well as in Asia. Zurmang centers can now be found in Singapore, Hong Kong, Indonesia, and Malaysia. In 1990, the Mayor of Los Angeles honored him with the Keys to the City, making him an honorary citizen of the USA. In August 1991, Gharwang Rinpoche returned for the first time to his original Seat in Zurmang Kham, (Qinghai province) amidst a rapturous welcome. During this memorable visit, Gharwang Rinpoche gave empowerments to well over thirty thousand people, many of them incarnate tulkus, monks, as well as the lay community. Thousands came to seek refuge with him, and he bestowed personal blessings upon all those who came to greet him. Rinpoche presented many precious gifts to the people of Qinghai. Among them, were a towering gold-plated Buddha measuring 15 feet high, a golden dharma wheel flanked by two listening deer, as well as a khengere (a bell-shaped object symbolizing the ever flourishing dharma), which is traditionally placed on the roof of a monastery. During his brief stay in Tibet, Gharwang Rinpoche actively encouraged and contributed generously to welfare projects throughout the region. In the same year, Rinpoche was inspired to establish the Zurmang Kagyu Buddhist Foundation, with the specific purpose of realizing his vision of a more benevolent society in accordance with the spirit of Buddhism. To that end, he as initiated many community projects such as the construction of roads, schools, medical dispensaries, orphanages, and homes for the elderly. In 1992, Gharwang Rinpoche commenced the construction of a new Seat for the Zurmang Kagyu Tradition in Lingdum, Sikkim. The site covers approximately 21 acres of forested slope on the same hill occupied by Rumtek. In under four years, he transformed the landscape of Lingdum into a magnificent monastic complex, fulfilling the prediction of the Sixteenth Gyalwa Karmapa of a new Zurmang Kagyu monastery outside of Tibet.